This issue doubles as a catalog-of-sorts to Ecstatic Alphabets/Heaps of Language, a group exhibition curated by Laura Hoptman at The Museum of Modern Art, New York, from May 6 to August 27, 2012. It is a *pseudo*-catalog in the sense that, other than a section of images at the back, it bears no direct relation to the works in the exhibition. Instead, the bulletins extend in different directions from the same title, and could be collectively summarized as preoccupied with the more social aspects of Typography. In this way we hope to throw some *glancing* light on the exhibition. For further explication, see the trailer for for the publication, as displayed in the show itself; and a Q&A with MoMA curatorial assistant Eleonore Hugendubel about the whole process. 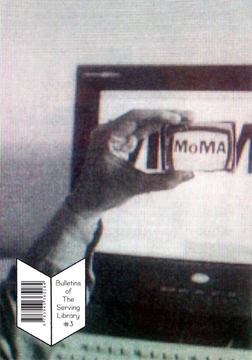 Bulletins this time around come from Andrew Blum, Bruno Latour, Graham Meyer, Pierre-André Boutang, David Reinfurt, Chris Evans, Jessica Winter, Ian Svenonius, Angie Keefer, Francis McKee, Benjamin Tiven, Louis Lüthi, Dexter Sinister, and Laura Hoptman.